A-pillar: The two vertical struts sitting either side of and supporting the windscreen. The A-pillars are a critical part of the crash structure and increasingly house a side airbags. Some A-pillars are split in two in order to improve forward visibility. ABS: Antilock Braking System – A computerised system that prevents the wheels from locking during emergency braking, improving steering control and reducing stopping distances. ACC: Adaptive Cruise Control – An advanced automatic vehicle speed management system that monitors traffic ahead and reduces or increases the car’s speed based on the flow of traffic. Airbag: A bag designed to protect vehicle occupants from injury in the event of a vehicle collision and which inflates on impact. Airbags can be found in the dashboard, at knee level, in the sides of seats, in the doors and elsewhere, and typically inflate with nitrogen gas at a speed of 1/20 of a second. Alcantara: A suede-like material that is used mainly in premium vehicles. The grippy yet soft touch nature suits premium sports cars in particular. Alternator: Converts mechanical energy from the engine into alternating electrical current for the battery, which powers the vehicle’s electrical systems. Appreciation: When a vehicle’s value increases over time. A/T: Automatic transmission – A gearbox that shifts through gears automatically, no need for a manual clutch and gearstick. AWD: All-Wheel Drive – When power is fed to all four wheels, otherwise known as four-wheel drive or 4WD. AWW: Automatic Windscreen Wipers – Wipers that come on when an infrared optical sensor mounted on the windscreen detects changing levels of light reflected by the glass as a result of rain water. The system adjusts the wiper speed in response to the level of water. B-pillar: The vertical struts running from the roof to the waist-line of a vehicle, between the front and rear side windows. Provides strength to the mid-section of the vehicle. BHP: Brake Horsepower – The measure of an engine’s horsepower output before frictional losses caused by components such as the gearbox, alternator and differential. C-pillar: The third strut running from the roof to the waistline of a vehicle, after the A-pillar and B-pillar. Coupé: A two-door car with a fixed roof, which is often shorter and more steeply angled at the rear than its saloon equivalent, giving them a sporty look. Coupés often have limited space and headroom for rear passengers. CO2: Carbon Dioxide – an exhaust emission, measured in grams produced per kilometre (g/km) driven. CO2 emissions are also the basis for vehicle tax, with higher emitting vehicles penalised. Crankcase: The bottom of the engine housing the crankshaft, which is driven by the pistons attached to it via connecting rods. Crossover: A type of SUV based on a car platform. Cut and Shut: An accident damaged car that has been repaired by fusing one or more vehicles together. Cylinder: The part of the engine between the crankcase and the cylinder head in which the piston moves, and in which the compression and ignition of the fuel mixture takes place. There are various cylinder arrangements – three, four or six in line, six or eight in a V-shape, a W-shaped arrangement composed of two V-banks and two banks of three cylinders horizontally opposed in a so-called ‘boxer’ format. Cylinder head: The machined component that sits on top of the cylinder block, closing it to create the combustion chambers. It is important that there is good sealing between it and the block. D-pillar: Found on larger cars, such as SUVs and estates, the D-pillars are the vertical (or near vertical) struts found either side of and support the rear window. Dampers: Suspension components that depress the impact energy of the car rising and falling as it travels. Also known as ‘shock absorbers’. DDI: Direct Diesel Injection – A diesel engine that sprays atomised fuel directly into the combustion chamber of each cylinder, improving performance and fuel economy. Depreciation: the proportion of a vehicle’s purchase price that is lost over time. Diesel engine: An internal combustion engine that runs on diesel fuel. Diesel engines work at a much higher compression than petrol engines, generate higher torque and use less fuel. Differential: A mechanical device that allows the driven wheels of a car to turn at different speeds, splitting engine torque between the wheels so that the outside wheel in a corner can rotate faster than the inside wheel. DOHC: Double Overhead Camshaft – A more powerful engine design with two camshafts positioned at the top of the cylinder heads, one to operate the intake valves and one to operate the exhaust valves. DPF: Diesel Particulate Filter – Traps particulates in a diesel-engine vehicle’s exhaust. Particles are then burned off at high temperatures. DRL: Daytime Running Lights - Lights designed to stay on at all times, in some cases they can lower your insurance costs so be sure to mention them when getting a quote. Dry weight: The kerb weight of a vehicle, which excludes occupants and cargo, with the further exclusion of consumables such as fuel, oil and water. DSG: Direct-Shift Gearbox – Volkswagen Group’s dual-clutch gearbox which dispenses with a conventional clutch pedal and allows either full automatic operation or semi-manual control via the floor-mounted selector and steering wheel paddles. Dual Fuel: A car that will run on one or more fuel sources. E-REV: Extended-Range Electric Vehicle – Designed to eliminate the ‘range anxiety’ associated with pure electric vehicles, it uses an electric motor for propulsion but also uses an internal combustion engine to generate electrical power and maintain a minimum level of charge in the battery when it gets low. Unlike a Plug-in Hybrid, an E-REV doesn’t use the petrol/diesel engine to directly power the wheels. ESC: Electronic Stability Control – An electronic program that applies the brakes to a specific wheel when a loss of steering control is detected. Helps combat understeer and oversteer events to improve safety. Also known as Dynamic Stability Control (DSC) or Electronic Stability Program (ESP). Estate cars: A car with an extended load space behind the rear seats, accessed by a door at the rear. EV: Electric Vehicle – A blanket term to describe any type of vehicle that is primarily powered by an electric motor. Can include Extended-Range Electric Vehicles (E-REVs), Plug-in Hybrids (PHEVs) and Hydrogen Fuel Cell (HFC) vehicles. FDSH: Full Dealer Service History – as FSH (see below) but the service stamps have been acquired from a registered dealer. FFV: Flexible Fuel Vehicles – a vehicle that is fuelled by a blend of ethanol and unleaded/petrol. FSH: Full Service History – often seen in used car adverts to denote a full log of regular maintenance and annual service stamps from service outlets. Fuel Injection: A system by which atomised fuel is sprayed directly into the combustion chamber of each cylinder of the engine. FWD: Front Wheel Drive – When engine power and torque is channeled to the front wheels only. GPS: Global Positioning System – The network of satellites that provides the location and time information used by a vehicle’s Satellite Navigation (Sat Nav) system. Gross weight: The kerb weight of a vehicle or trailer plus the maximum load that can be carried safely for use on the road, including occupants and cargo. GT: Grand Tourer – A car that is designed for long-distance driving. Usually used as a prefix or suffix on high-performance, luxury vehicles. Hatchback: A car that offers easier access to the cargo area with a boot lid that incorporates a large section of the rear section of the car, including the rear window. HP: Horsepower – The measure of an engine’s work rate, which is torque (twisting force) multiplied by speed (how fast it is spinning). It’s a useful measure of how quickly a car can overcome issues like weight and drag when moving. HPI Check: A used vehicle history checking service that provides a report to determine if the car is stolen, accident damaged, written off or clocked. Hybrid: A vehicle that is powered by both a petrol engine and battery-powered electric motors. ICE: Internal Combustion Engine vehicle – abbreviation increasingly used to differentiate vehicles purely powered by petrol, diesel or other form of combustible fuels from electric or hybrid vehicles. Independent suspension: A suspension system that allows each wheel on the same axle to move up and down independently of the other. Intercooler: A system that cools the hot gas that has been compressed by either a turbocharger or supercharger before entering the engine, increasing its density and therefore the engine’s power output. ISOFIX: The international standard attachment for child safety seats which permits a compliant seat to be fixed to anchor points on the car rather than secured solely by the seatbelt. 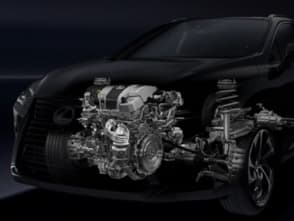 i-VTEC: Intelligent Variable Valve Timing and Lift Electronic Control – Honda’s variable valve control system that improves efficiency at low engine revs and performance at high revs. J-turn: A driving manoeuvre in which a car being driven backwards is, without stopping, quickly turned almost about its axis so as to continue in the same direction but facing forwards. Kerb weight: The weight of a vehicle or trailer including fluids such as fuel, oil and water but excluding occupants and cargo. See also Dry weight and Gross weight. KPH: Kilometres Per Hour – The number of kilometres a vehicle can travel at a constant speed in one hour. Leaf-spring suspension: A simple form of suspension made up of a number of curved metal strips clamped together. LED: Light Emitting Diode – a type of light source that requires less power to run than conventional filament bulbs and is often used on modern cars for low-beam headlights, brake lights, indicators and daylight running lights. List price: refers to the cost of the car as it is driven off the dealership forecourt. It starts with the retail cost of the car from the factory to which are added any additional fees required to drive the car away including taxes, insurance, delivery fees, etc. Also known as the “On the road” price. LSD: Limited Slip Differential – A standard differential will split power to the driven wheels via the path of least resistance, meaning if one wheel is off the ground or on a slippery surface it will be fed 100 per cent of the power and the vehicle will go nowhere. A limited slip diff prevents all the power being transmitted to the spinning wheel, instead allocating a proportion of the power to the other driven wheels that have grip. LPG: Liquid Petroleum Gas – A flammable mixture of propane and butane that can be used as a vehicle fuel. It is considered a ‘greener’ alternative to petrol because less exhaust CO2 is produced. Also known as Autogas or Auto Propane. LWB: Long Wheelbase – A lengthened version of an existing vehicle chassis. MacPherson Strut: A type of suspension in which a coil spring is positioned over a shock-absorbing strut. The benefits are fewer parts and less weight than conventional suspension systems. Marque: The vehicle make, or brand. Monocoque chassis: The widely adopted structure of modern cars where the body supports the car’s structural load, rather than relying on a separate chassis. MPG: Miles Per Gallon – The number of miles a vehicle can travel per gallon of fuel consumed. Officially expressed as urban (city), extra urban (rural roads) and combined (a mix of city and rural). MPH: Miles Per Hour – The number of miles a vehicle can travel at a constant speed in one hour. MPV: Multi-Purpose Vehicle – a vehicle based on a family-car chassis and designed to provide maximum cabin space and versatility. Also known as People Carriers (UK) and Minivans (USA). Multi-link suspension: A type of suspension using three or more lateral arms and one or more longitudinal arms, allowing both good ride and handling but at the cost of complexity and expense. Naturally aspirated: An engine in which the cylinders draw in the fuel mixture under atmospheric pressure by the suction action of the pistons during induction, rather than it being forced in by a turbocharger or supercharger. Notchback: A car body style where the rear of the car is short or the rear window is more upright than normal. Can apply to a saloon, coupé or hatchback body style. NVH: Noise, Vibration and Harshness – A measure of the noise and vibration characteristics of vehicles as well as a subjective measure of the quality of the ride. There are legal requirements regarding exterior noise and interior vibration but car makers will spend a great deal of time fine tuning the NVH of each new model to make it acceptable to the brand and the vehicle’s class. Octane: A colourless, flammable hydrocarbon found in petrol that reduces engine knock, when pockets of air/fuel mixture detonate after the main combustion. High-octane petrol performs well in sporty, high compression engines. Odometer: Device used to record mileage throughout a vehicle’s lifetime. Also known as a ‘milometer’. OTR: On The Road – Related to car prices, this refers to the cost of the car as it is driven off the dealership forecourt. It starts with the retail cost of the car from the factory to which are added any additional fees required to drive the car away including taxes, insurance, delivery fees, etc. Also known as the “List price”. Oversteer: A condition in which, as the car corners the rear wheels lose grip, provoking the possibility of a tail-out slide. Petrol engine: A type of internal combustion engine that uses petroleum fuel. The petrol is mixed with air and ignited in cylinders, forcing down a piston whose motion ultimately powers the vehicle’s wheels. On the piston’s upstroke, waste gases are forced out of the cylinder and expelled through the exhaust system. PHEV: Plug-in Hybrid Electric Vehicle – a type of Hybrid vehicle with a larger on-board propulsion battery that gives better range in pure electric power. The propulsion battery can be plugged into an electrical supply and charged. Pillars: The vertical or near-vertical struts that run from the roof to the waist of a vehicle, increasing body strength. Platform: In manufacturing, refers to base components of a car including its chassis, floorpan, suspension and steering system. A single manufacturer can create a platform that is shared across a number of its own models and different manufacturers can share platforms with each other. This helps reduce costs through economies of scale. Power Steering: Steering that is aided by electric or hydraulic motors. This reduces the effort required by the driver to turn the wheels, particularly at low speed. PS: An alternative measure of engine power output to BHP, used primarily in Continental Europe. PS comes from the German word ‘Pferdestärke’, meaning ‘horse strength’). To convert PS to BHP, multiply the PS figure by .986. Privacy Glass: An upmarket term for tinted windows. Q Plate: Registration plates starting with a Q indicate the vehicle was either not originally registered in the UK and proof of its age was not available at time of registration, or that it was built using a large number of off-the-shelf parts. Range: In reference to an electric vehicle (EV), the distance you can travel on pure electric power before the battery requires a charge. Range Anxiety: A term used to describe the fear of running out of battery charge while driving a pure electric vehicle. Regenerative Braking: An energy recovery system used in most electric vehicles that can help charge the battery while the car is slowing down. Typically the electric motor acts as the generator, so power can flow both ways between it and the battery. Ringer: A car whose true identity has been disguised by using a registration mark from another vehicle, typically one that has been written off. Check all VINs on a used car (stamped into the bodywork, on the chassis and behind the windscreen) if you are unsure of its history, and run an HPI check. Road Tax Band: A vehicle’s grouping according to the amount of annual tax that must be paid. In the UK, bands range from ‘A’ (least tax payable) to ‘M’ (most tax payable) according to the amount of exhaust CO2 produced. RPM: Revolutions Per Minute – The number of times the crankshaft of a motor turns through 360 degrees in one minute. RWD: Rear Wheel Drive – Power from the engine is sent to the rear wheels only. Saloon: A car with three distinct sections; one central compartment for passengers, one in front, typically to house the engine and front wheels, and one behind, usually for cargo (known as a three-box configuration). Saloon cars can come with two or four doors, and can come with a boot that opens with a lid or with a hatchback. Sat Nav/Satellite Navigation: Mapping and guidance system that uses Global Positioning Satellites to detect a car’s position and determine a route to a desired location. SUV: Sports Utility Vehicle – a tall-bodied vehicle with some off-road capability but designed mainly to perform well on roads. SUVs may have four-wheel drive, but may also be two-wheel drive, and have varying degrees of off-road capability. Within the catch-all term, SUV, can be found 'Crossover', a type of vehicle not built from the ground up as an SUV but instead based on a car platform. Supercharger: Similar to a turbocharger but the compressor is mechanically driven by the engine rather than being powered by the exhaust gases. Superchargers do not suffer from ‘lag’ but do require a portion of the engine’s output to power them. Suspension: The springs, wishbones, dampers and links that attach a vehicle to its wheels. The main function of suspension is to provide a car’s specific ride and handling characteristics. TCS: Traction Control System – an electronic system that contains wheel spin by cutting engine power and/or applying brake pulses. TFT: Thin Film Transistor - A type of advanced LCD (liquid-crystal display) screen used to display information about the car’s functions and controls. TFT screens are usually more suitable for video and animated menus. Torque: Torque determines how quickly power can be transferred to the wheels and is particularly useful as a measure of acceleration. Torque steer: An imbalance of driving force between the front wheels of a front-wheel-drive vehicle that causes the car to pull to the left or right under heavy acceleration. Can be an issue with powerful front-drive models. Torsional rigidity: The resistance of the vehicle’s body to twisting forces. The higher the torsional rigidity, the less likely the vehicle is to flex while cornering or travelling over bumps, which improves handling and NVH. Transmission: Most often refers to the type of gearbox employed by a vehicle, typically automatic (auto) or manual, although several types of semi-automatic versions are available. Trim level: The specification of the vehicle, including but not limited to wheel type/size, materials used in the interior, bundled technology, etc. The choices are often grouped together and priced from low cost “entry-level” trim to a “range-topping” highest specification option. Trim levels do not usual refer to the engine, rather a specific engine can be specified for each trim level. Turbocharger: A method of getting more air into the cylinders by compressing it and blowing it in, increasing the engine’s power. The atmospheric air is compressed via a turbine that is spun by exhaust gases from the engine. Understeer: A condition during cornering where the car tends to push on in a straight line rather than following the arc of the corner. Valves: Devices actuated by the camshaft that open and close around the combustion chamber to allow the fuel mixture in and exhaust gases out. High performance engines typically have four valves – two inlet and two exhaust – per cylinder. Vehicle platform: The fundamental components that comprise a vehicle and which include the floorpan – the basis of the monocoque chassis – front and rear axles a set distance apart, the steering system, the type of front and rear suspensions and the location and orientation of the engine and powertrain. The platform is often shared between models and marques to provide substantial cost savings. VIN: Vehicle Identification Number – a unique number, usually 17 digits, given to each vehicle during the manufacturing process. VINs can be used to identify vehicles so that their history can be checked. VRM: Vehicle Registration Mark – the number plate. Wankel engine: A type of compact rotary engine in which, simply put, the combustion process spins a triangular-shaped rotor inside an oval housing. Its main benefit is delivering smooth power from a relatively small capacity at high revs. Wheelbase: The distance between centre points of the front and rear wheels. Xenon: High-powered headlight bulbs that increase intensity and brightness. ZiL lanes: Lanes on some of Moscow’s major roads reserved exclusively for government officials and named after the manufacturer of Russian-built armoured limousines. The term was also used to describe the lanes on roads in London reserved for cars carrying officials and athletes during the 2012 Olympic Games. "Never Raced or Rallied" - Always be wary of an advertiser that feels the need to tell you this. "Low Mileage For Age" - Modern diesel engines are capable of covering huge mileages, but for the reassurance, always make sure your used car has a good service history with it. "Some Service History" - A classic salesperson’s line meaning 'this car has virtually no documents'. Avoid anything that doesn't have a proper service history! "Very Little Use" - Sometimes a low mileage car is worse than a high mileage car. If the car has been stationary for ages the parts can get seized or stuck.